A library represents the culture and the personality of a neighborhood. 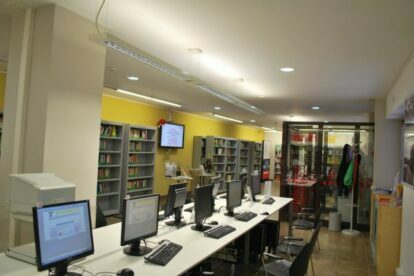 The Biblioteca Goffredo Mameli, in the Pigneto area, has that duty as well. Open for everyone, you just need an ID or passport to use the computer for free (max ninety minutes) or drink a coffee for 50 cents (machine coffee but it’s not that bad) at the pleasant garden. You can also bring your laptop, use the library’s wifi and relax at the garden’s tables, but you must have paid ten euros to become a member for one year first. It’s not wasted money, even for a few days, since you will be supporting the quarter’s culture. It’s one of my favorite place to read, write and learn about nearby events. Sometimes they have particular event such as art performances and expositions. It’s a nice pit stop, along Pigneto’s main street, to organize yourself and charge your battery, both while on a trip or in ordinary life.